At Process Street, we recognize the importance of being able to integrate our platform with the other tools you use within your company. Improving your workflows increases your output and your productivity. Automating them maximizes those aims. In this article, we look at the survey tool Typeform which provides a clean and simplified way to launch survey campaigns which are easy and enjoyable for your audience to take. A small company wants to use a Typeform survey to assess customer satisfaction. The company wants to reach out to the respondents who consented to be contacted. We will send a Typeform feedback survey to clients. We will configure this survey to launch a checklist inside Process Street when someone submits their completed survey. We will only launch checklists for respondents who consented to be contacted by providing their email. We will allocate the checklist to a member of your customer success team. We will auto-populate the checklist with the client’s responses so they can be acted upon. We use the third party automation service Zapier to connect our platform with different webapps. Within Zapier’s community, there are over 750 different webapps and services you can connect to. These connections are referred to as zaps. Generally, you will only need to setup the zap one time. This gives you the time to focus on the important things rather than repetitive tasks. Zapier is structured so that you pick a trigger and then an action. In our integration, submitting a Typefrom survey is going to trigger the zap. The zap will then take the data and give that to Process Street where it will perform the action of launching a checklist. 1. Click on the make a zap button at the top of your screen. This will take you to the zap building screen where Zapier guides you through the process with a step-by-step left-hand column and a middle section where you can configure your zap’s settings. The first screen should look like this. Now you can search in that bar for the app you want to start with. 2. Search for Typeform and select it. We need to connect our Typeform account with the Zapier account, and we need to find our survey to connect that too. 3. Take the API key from the My Account screen in Typeform and enter it into Zapier. When this is completed your screen should look like this. 4. Choose which survey you want to pull information from. To finish, go to your Typeform account, launch the survey, and fill it out. Return to Zapier and click Fetch + Continue. This will make Zapier look for the action you took to verify that everything is set up correctly. 1. Click the plus icon to add a filter. This will show you the parameters you can filter by. 2. Launch a checklist if the email has been provided. In the survey, we ask the client if they consent to be contacted about their response. If they consent, they enter their email in the section provided. Choose the parameters as seen in the image below. Click continue to test this step and move on to setting up your Process Street integration. 1. Select Process Street as your action app. It should offer you the trigger option: Create Checklist. 2. Connect your Process Street account with Zapier. You can find the API key in your organization manager under the tab Settings & API. Once you have your Process Street account selected, click test to check it is all working and your screen should look like this one below. 3. Select the Process Street template you want to launch from when the form is submitted. In the Template section, click the dropdown to find your customer success template. Click on the icon to the right of the field – if you hover your cursor over it, it should say “Insert a Field”. This will show you the data available from the Typeform survey. I’ve selected the answer Company Name so that all my Process Street checklists will be ordered by the names of my clients’ companies. You can find a number of Zapier help articles about general help with field types or specific articles for modifying dates and times. I’ve chosen the option Submit Date. This is metadata which is automatically recorded by Typeform. I’ve taken this Submit Date and added “+24h” on the end. This means the checklist is due 1 day after the survey is initially submitted. 6. Find your customer success team member and assign them the checklist. There is the option to add multiple people to one checklist by using the plus and minus buttons on the right of your screen. Use the dropdown arrow to show a list of your users and select the one you want to allocate to. In the checklist, I have included fields for the client’s name, email, and their feedback. These show up in Zapier as fields you can add typeform responses to. For each form field, click on the button to the left to chose the response you want to automatically add in. You can choose the option “Form responses” for the Customer feedback step to enter all the survey answers into this section. 8. Test your zap when you have finished. 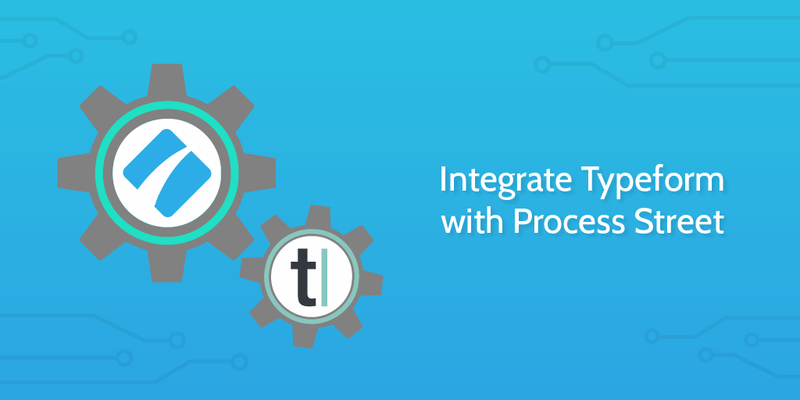 This should complete the setup of the integration between Typeform and Process Street. Work through your integration from start to finish to check everything is working correctly before employing it in the wild.